This recipe was one of my go-to weeknight recipes before Whole 30 and now I love it even more! It has tons of flavor and is so refreshing, particularly in the warmer months. 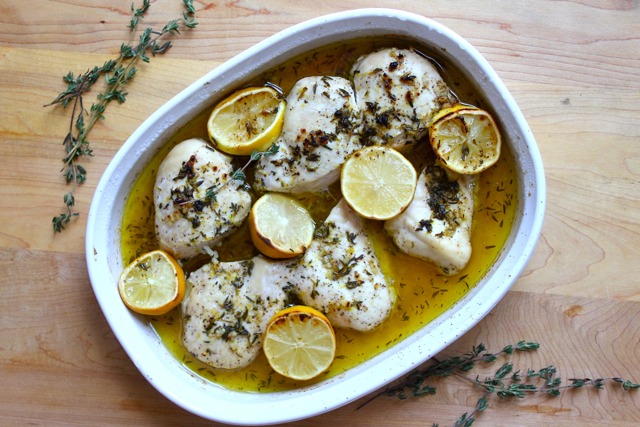 I've been making this Lemon and Thyme Chicken in bulk on the weekends to eat for lunch during the week. Sometimes I eat it warm with roasted veggies but most of the time I eat it cold over a salad. I snagged the original recipe from Kelly at Eat Yourself Skinny, which is a lower fat/lower calorie version but I've added some healthy oil to the recipe for two reasons. Number one, Whole 30 requires us to eat healthy fats so that we have enough calories to sustain ourselves (plus, healthy fats ARE good for us) and number two, the marinade later becomes a delicious salad dressing. One quick note on that. The oil in the marinade does solidify a bit in the refrigerator but a few seconds in the microwave will fix it. I only have one more week left on this Whole 30 journey and I will give you another recap soon. If you missed my earlier posts, Why I chose Whole 30 and The first two weeks on Whole 30, feel free to read those if you're interested. 1. Preheat oven to 325 degrees. In a bowl, combine olive oil, lemon zest, lemon juice salt, pepper, garlic and thyme. 3. Bake the chicken for 25 minutes or until cooked through. Allow chicken to rest for 10 minutes before serving. If you're placing it in the refrigerator to eat later, be sure to allow the chicken to cool completely first.